I picked up my new glasses yesterday. Thanks to a “BOGO” sale I purchased two pairs to cover my dual identities: “posh businesswoman” and “sporty grandma on the go”. I’m just one week into my health insurance coverage calendar and I’ve already spent the entire year’s allowance. It’s my first rodeo with progressive lenses – the kind with a distance prescription in the top, a reading part at the bottom, and an intermediate range between them. The sides are a no-man’s land of distortion so good-bye to peripheral vision. “It takes some getting used to,” said the young optician, whose trendy specs were either blanks or single vision. This bi-focal stuff is for the over-forty crowd. I assumed her advice comes from customer anecdotes rather than first-hand experience, but her glasses were so alluring that I listened intently. Her style gave her credibility. I popped on the sporty grandma pair and hopped into my car, eager to start the new experience. I could see the road! I could see the speedometer! I could see the dash! The lights! The trees! Whoops, the crosswalk was a bit blurred, better watch that. I went to the grocery store and delighted in my ability to recognize other shoppers, read product labels, and check my watch while wearing these new glasses. In the past, a trip to the store meant I would wear my distance glasses (necessary for driving) and then upon arrival I’d have to remove them to be able to read prices or labels, which involved lots of oh-so-attractive squinting. Of course, then I couldn’t see people around me very well, so if a familiar-looking blur approached I’d do the squint thing again until they were close enough to recognize, by which time I’d potentially offended them with my “stink eye” expression and oddly delayed greeting. Awkward interpersonal exchanges were common. Like so many things in life, the situation had to get uncomfortable enough to require a solution. 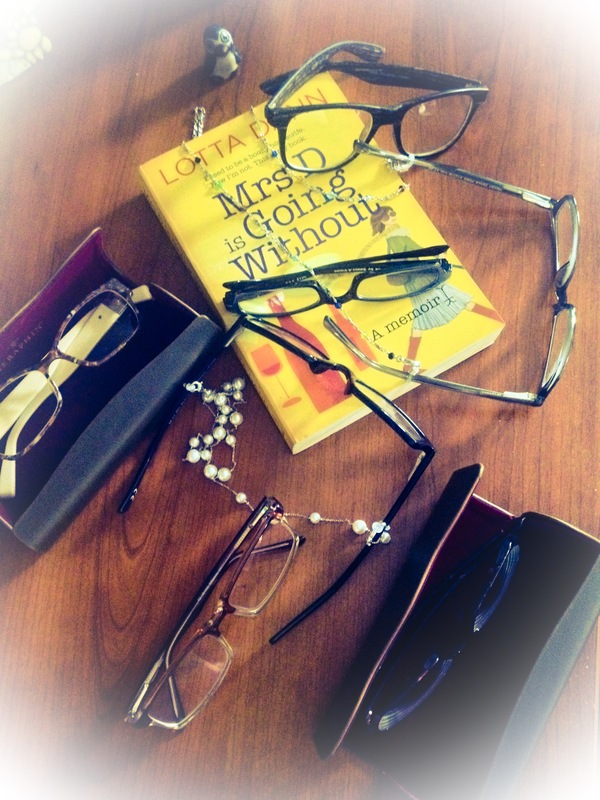 There are inexpensive reading glasses scattered throughout my house – six pairs at least – yet rarely is one within reach when I need it. Over the past decade I have also accumulated four pairs of pricey prescription distance glasses, which float between my car, kitchen, purse and desk but only occasionally turn up in the right place at the right time in coordination with my ensemble. It was a constant crap-shoot and even when I had the right pair when needed, they still only partly solved the problem. I even tried monovision contacts, presuming them the answer to my prayers: a reading lens in one eye, a distance lens in the other. After a few days of experiencing a fish-bowl effect, the brain sorts out which eye to use and which one to ignore. That left me only doing the weird squint face for the intermediate range – generally at my computer screen. I loved the freedom of wearing contacts and the constant wonder of my brain’s ability to adapt, but my eyeballs took issue with the intrusion and regularly spit out the lenses. I was starting to recognize a pattern that echoed my experiences as a person in recovery: this is too complicated; I am a special case; what works for everyone else won’t work for me; I am finding my own ways to manage; I tried adapting and it didn’t work; I don’t really want to change; I reject the ultimate solution. I am 47 years old and I don’t want to wear glasses all the time. I thought if I just kept them handy and popped them on when I needed them I could get by. And it worked for a while, but my vision worsened and now I need a new solution; one that requires change, adjustment, and a willingness to accept a new version of myself. I smiled at the irony of her earnest advice, words that reflected a profound life lesson that came as a result of overcoming my addiction to alcohol. Be willing to change yourself, and everything else will improve. Bless her heart, I expect this young woman has no awareness of the metaphor. As for me, I simply love my new world view; figuratively and literally. Granny on the go. That makes me laugh. I’m expect I will be following in the bifocal requirements soon enough. Sigh. Hi Jean I am now almost two years sober and still feeling at peace with it. I have developed quite a disciplined life and spending as much time as I can caring for an ageing parent and a beautiful grandchild. I feel like I am the only sober one around as everyone else in my extended family drinks. I have only had two difficult occasions and they were both at weddings. I don’t know why but I find weddings the hardest. It is not a matter of wanting a drink it is more about feeling flat and not wanting to dance. I used to love dancing after a few drinks. I can’t seem to enjoy dancing sober. Has anyone got any ideas. I was thinking of doing a zumba class to get some rhythm happening. I have lost a bit of energy lately and think that I may have a low thyroid or a pre diabetes condition. I will go and have that checked out. I sometimes think I would like to let my hair down with a drink again but the visions of the secret cupboard drinks frightens me off those thoughts. I am enjoying your daily blogs Jean. I still regularly read the Unpickled blogs. When I was a young teenager I used to sit on the phone to my best friend for hours. People don’t seem to do that any longer as they are putting social media before their real friends. I worry about the impacts of texting vs talking on people’s ability to confront issues that are troubling them. Does anyone else out there share my concerns? I love dancing at parties or weddings and after quitting felt more reserved. I started taking Zumba class a few months ago and went to a party the other night and felt great dancing. I think the Zumba freed me a little. Great that you are at 2 years, I just passed one year and am so happy that I quit. Hi CC – it is GREAT to hear from you again! I am so glad you are continuing successfully forward. Wonderful! I notice my kids don’t have those long phone conversations like we used to, but I also note that they do communicate constantly in other ways. Their world is different than ours. They will find their way. As for us, tho, we do need to have real face time with others, we do. Have IRL (In real life) support gives rocket power to recovery. It is possible to succeed without it, but once you have it you feel stronger. I also to the optometrist this week. I have had transitions glasses for several years, but it was the first time when he asked me if I drink, you know socially or otherwise. I was able to say no I don’t drink at all, it felt great. I am one year sober and this year has taught me to look at life through different lenses. When I quit drinking I expected certain outcomes, and some of them were met. But in other ways,I have had to look through a different lense to really see the undistorted truth. One of my truths was, I would be less happier, but healthier without drinking. I have found that after the first 6 months, I am just as happy. So I am healthier, but also happier; drinking put lots of unneeded stress on me. Anyway, I am enjoying your daily blogging, it has brightened my day. I look forward to being able to say I am in long term recovery. I was worried that I couldn’t really recover without AA, and reading your blogs and others has given me the confidence to do my programs, journaling, yoga, reading and replying to blogs and being grateful. Your comment makes me so happy, Jean (nice name, lady!). It really is a beautiful way to live, isn’t it? Who knew what we were missing? i’ve been wearing progressives for years and adore them. Just a hint tho, for me, it is easier to actually read a book, at home, with a pair of readers….there’s something about the small area for reading in the progressives that just makes it a pain. Good job on all your posts and tying them onto sobriety! Your posts this month really hit home. I am one week sober today. Since it is Saturday, I am struggling a bit but determined to deal with my truths and see things as they really are. Change is a challenge but in the end I know I will like my true self. Tired of living the lie, drunk or hungover is not a lifestyle. Thank you for your insights. They help more than you know. Thank you for sharing this. I am glad you are here. Please keep me posted on your progress and don’t be afraid to shout if you need help or ask questions if you are curious. We are all in this together and have so much to learn from one another. Unfortunately bifocals AREN’T only for the over 40 crowd. I’ve got a few years to get there but finally broke down and took my optometrist’s suggestion to get some and get used to wearing them. I spent a year in denial before admitting I had a problem. Not as long as I spent denying I’m an addict, that took 10 years to really face and find my way to a 12-step program. It’s amazing, I can read small print AND see a face across the room! Recovery is similar for me too, admitting I have a problem and am powerless has provided new glasses for viewing both myself up close and the bigger picture of life further away.